From the acclaimed writer of "The Authority", Warren Ellis, the return of the smash-hit series that managed to shock, move and thought-provoke in one foul swoop! In the aftermath of Vita Severn's assassination, Spider goes looking for answers with two jaw-dropping interviews: one with the sitting President, 'The Beast', a venal, vicious scumbag who believes that absolute order is the best for everyone...and one with his Presidential challenger, 'The Smiler', who believes in...nothing. Revelations abound and the pressure builds for an explosive Election Day! Acclaimed writer Warren Ellis ("X-Men") and artist Darick Robertson ("The Boys") invite you back to visit their dysfunctional dystopia! Warning: Adults Only! 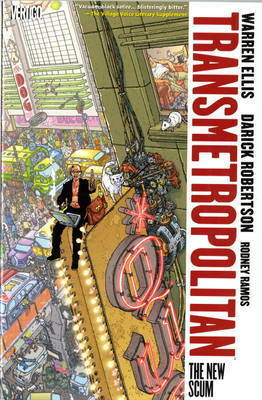 Warren Ellis has created and written The Authority, Transmetropolitan, Orbiter, the award-winning Planetary, Ministry of Space and much more. 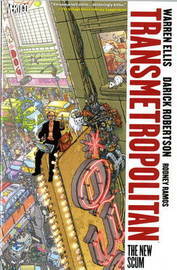 Darick Robertson is the artist and co-creator of Transmetropolitan. He is also the artist on The Boys and Fury, and creator of Space Beaver.